No-prep, 5th grade line plots and data math practice with 30 enrichment projects and 30 review test-prep questions aligned to the 5th grade math standards. A great way to teach the data standards in a fun, engaging way. 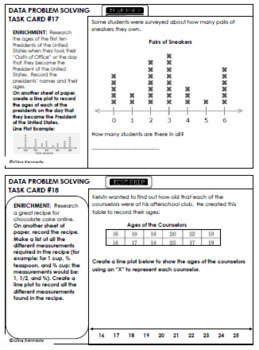 Perfect for early finishers, advanced math students or whole class practice. Print and go math enrichment! 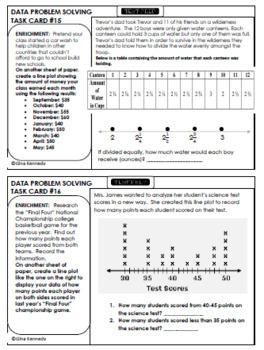 The task cards will provide a valuable resource for your classroom as an authentic line plots and data problem solving assessment to check for understanding of this important math concept as well as add depth to promote understanding of the new rigorous standards covered in this resource. 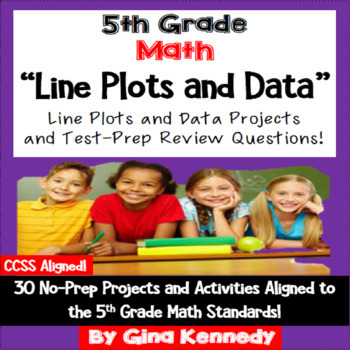 This resource will also prove to be a valuable tool to to provide real-life applications to use line plots and data in everyday problem solving skills. 5th Grade Math Common Core Interactive Notebook Daily Math Review: ALIGNED! 5th GRADE COMMON CORE Math, Writing & Reading DAILY "EXIT SLIPS" TEST REVIEW!